For a Lancashire lad now residing in Cheshire, I seem to have spent a lot of time in Yorkshire lately. With ‘Way of the Roses’ crossings, working on events based on Tour de France stages and then back to watch the actual tour, I feel like I’ve been there every other weekend of the year. 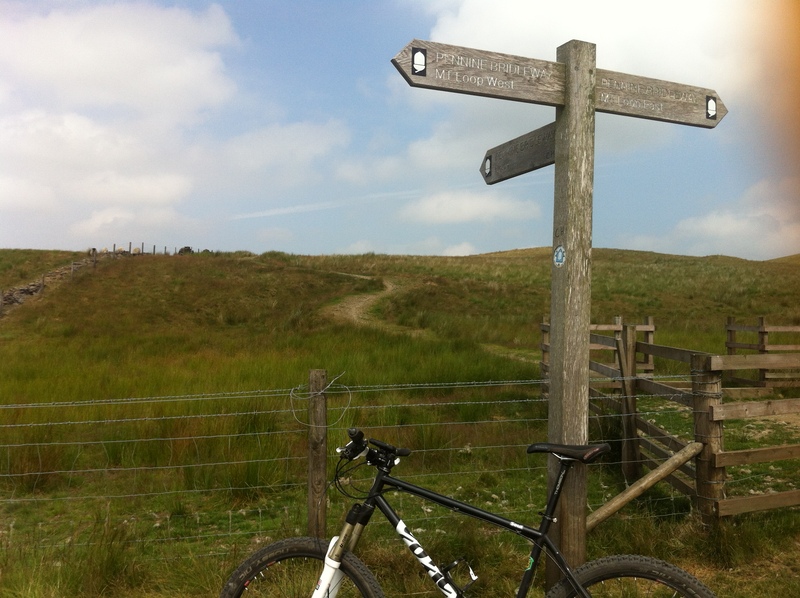 The mountain biker in me couldn’t ignore all the public bridleway signs that crossed the roads and checking the map revealed a vast network of bike friendly off-road routes across the Yorkshire Dales national park. Despite being the Dales being closer to Greater Manchester than the Lake District, this was only the second time I’d taken a mountain bike up there. Without a car, I used to catch the train to ride in new areas, but with our governments shortsighted refusal to spend even a fraction of the proposed HS2 budget on reopening a 12 mile trans-pennine route, the Dales weren’t practical to get to. Now armed with a car, it was time to check out what they had to offer. If you want a mountain bike guidebook to an unknown area, then the UK bibles are by Vertbrate Graphics. Their ‘Dark Peak” edition was my companion many years ago when the Peak District was an unknown territory and though I bought their ‘South Dales’ edition at the same time, I’d only used it once. I must have become much fitter/dafter/more enthusiastic over the years as this time when I pulled the book off the shelf I thumbed straight to the back to find the longest routes. I settled for the penultimate route of 30 miles that started from Settle, taking in Malham Tarn and Arncliffe. 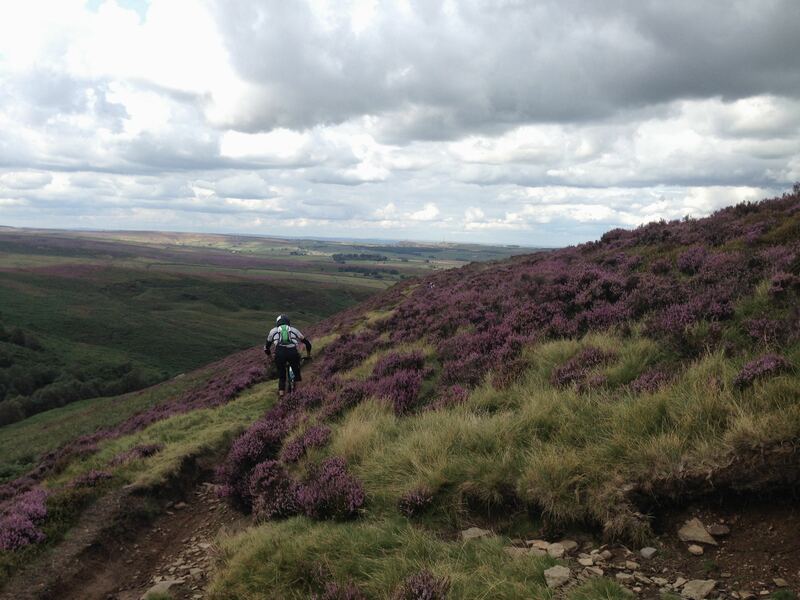 I had it in mind that the riding would be less brutal than the Peak District and less ‘epic’ than a similar Lakes route. Wrong. Maybe it was the heat that was uncharacteristically heading towards 30ºC or the fatigue from the previous days road-riding stupidity, but I was glad I didn’t pick the final 50 mile route from the book. The long ancient drovers routes lined on each side by classic limestone walls were easier under wheel, though the mix of grass and limestone would be slippery as hell in the wet. Some might say that the riding isn’t technical enough, but whether it was the heat or the idyllic setting, it was just fine for me. I was also conscious that with a Lands End to John OGroats job starting in a couple of days, I shouldn’t risk a crash. I found myself switching the Garmin’s screen away from the usual information to get concerned about, such as average speed, heart rate, elevation etc so I could enjoy the stunning views and take it all in. And that’s what made the day really. Having not been there previously I had no previous times to beat, Strava had no prior data to punish me with. It was just going out and pedalling up hills to see what was on the other side – just like when I started mountain biking! I’m not saying the route was a easy (and the long slog up from Arncliffe had me totally cooked) but the countryside and weather made this a four hour holiday for me. If you’ve followed the tour from Yorkshire into the Alps and Pyrenees you might expect a return to the Dales to be disappointing, but they have their own unique beauty. 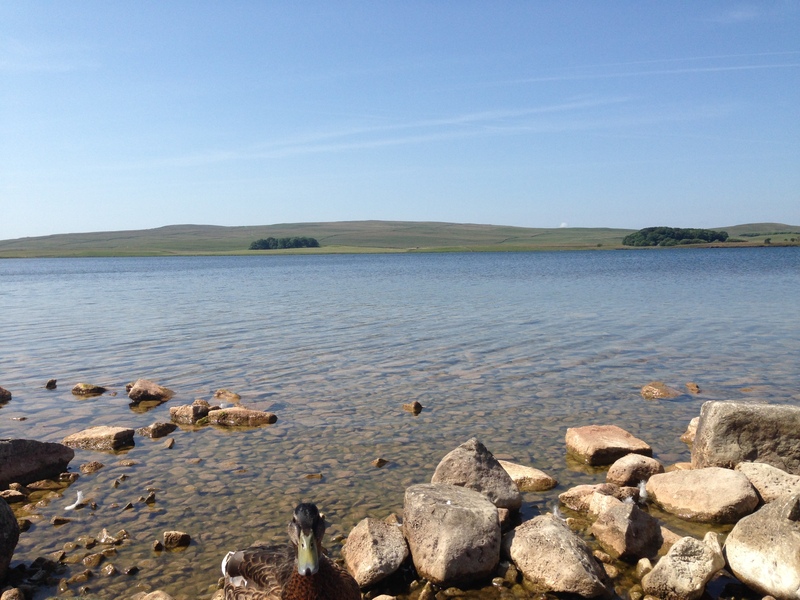 They’re drawn from a slightly lighter colour palette from the Lakes or Peak District and the trails also had their own geological quirks to keep you on your toes. The frequent hollows and dips were new to me and involved a quick fire game of ‘pump or pull’. And that’s got to be a good thing, as the wider variety of terrain you can ride, the better. So another enthusiastic thumbs-up for Yorkshire, but also for the simple pleasure of getting out and riding a bike somewhere new. 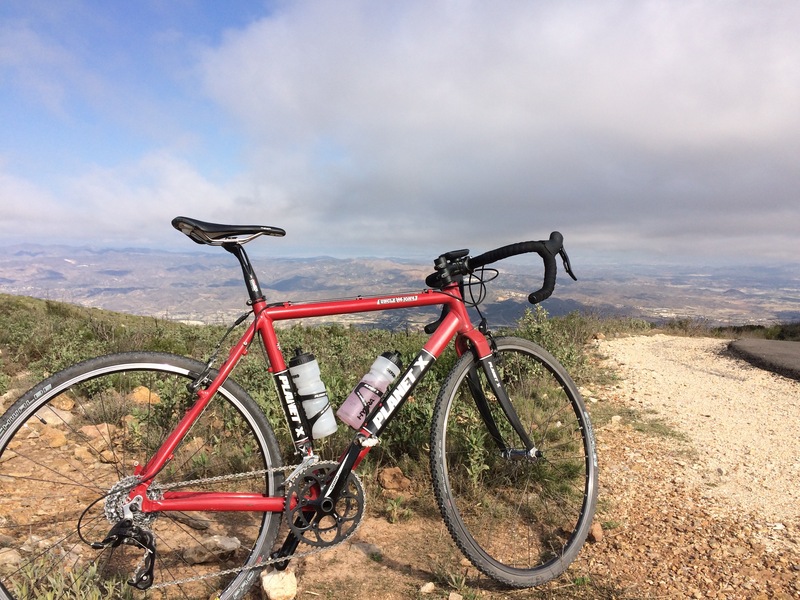 It recently occurred to me that despite a having healthy obsession for cycling and doing an increasing amount of work as a cycle tour guide, I hadn’t really done that much touring myself. Of course I do a lot of long solo rides and I cycle with the clients, but I’d not actually done much touring for leisure purposes. I’m working as a guide with the brilliant Peak Tours on the ‘Way Of The Roses’ coast-to-coast route next month, so to get familiar with the route (and justify some more time away from home) I planned my own mini-tour. 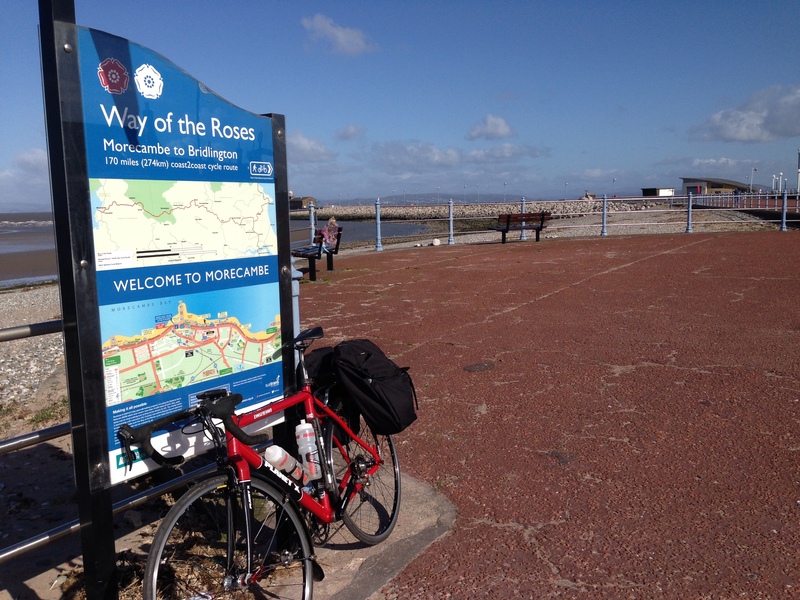 The Way Of The Roses is another UK national way-marked route from Sustrans, the same organisation that devised other routes such as the original C2C and the Trans Pennine Trail. I already knew both of those crossings well so was looking forward to seeing how ‘The Roses’ compared. Admittedly, Morecambe to Bridlington doesn’t sound too appealing on paper, though it’s nice to see Sustrans continuing their theme of linking English coastal towns that are past their best, either from a tourism or industrial perspective. No offence meant to any of these towns, as maybe it’s just growing up near Blackpool that’s clouded my judgement. But rejuvenating as the route is to these towns, the main event for us cyclo-tourists is the stunning countryside that lies between. Red Rose fans may be disappointed that the route leaves Lancashire after only 20 miles, but that’s what you get for starting at the thin end of the county, with the remaining 150 miles taking you through some beautiful and diverse Yorkshire landscapes. I was blessed with clear blue spring skies, and if it’s as fine in July then the world is in for a visual treat when Le Tour passes through. Most people, including our clients, ride it over four days though you could do it in any number of days you wanted. You could do it in a day if you were so minded, but it all depends on how you want to balance having enjoyable holiday with a gruelling physical challenge. With limited time and my usual over-enthusiasm, I did the route in a day and a half. There’s a train station at Morecambe, but the route start is only 4 miles away from the main line station at Lancaster so I got off there and pedalled to the start as a warm up. 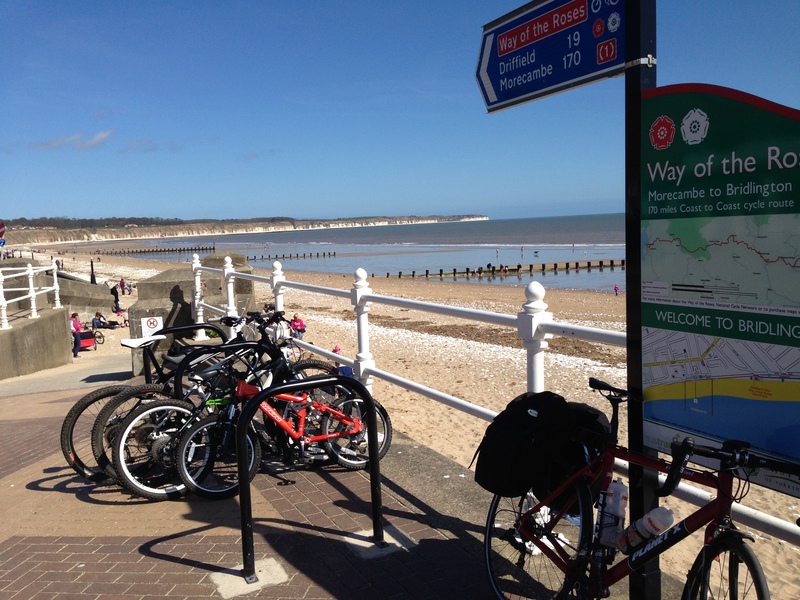 There’s also a station in Bridlington but I chose to pedal another 50 miles down the coast to Hull so I could catch a direct (and cheaper) train back to Manchester. Bike and tyre choice is often a dilemma for these routes due to the use of quiet lanes and the occasional off-road cycle path. I took my Planet X Uncle John ‘cross bike, looking very grown up with mudguards and panniers, though it still had 23mm winter road tyres on. The tyres survived ok, but I’ll be getting myself some decent touring tyres for when I do it again next month. I reckon some decent 28 or 30mm Marathons from Schwalbe should provide a little more comfort and security when cruising down a tatty lane. Cycling with loaded panniers took some getting used to. My brief test last week of riding to the shops and returning with panniers loaded with bottles of wine hadn’t really prepared me for long rides with the extra weight. The bike had a massive inertia; getting out of the saddle felt more like being on a turbo trainer and some hills had me reaching for lower gears than the 34/28 I had. It’ll be good training though and getting back on my Boardman should make me feel as spritely as Alberto Contador, if not actually as fast. So what’s the route like then? Absolutely superb! I found it less convoluted than the Trans Pennine Trail and even more picturesque than the C2C. Signage was good throughout, even as it takes you through York city centre. The route’s only a few years old so maybe it’s popularity will grow, but at the moment it’s very much the unsung hero of the Sustrans stable. It starts nice and gently through Lancashire, warming you up for the climbs through the Yorkshire Dales. A few of them are quite tough, but they’re not relentless enough to break your spirit and there are plenty of picture postcard villages to rest at if you need to. After the drama of the hills, emerging onto the Vale of York is a striking contrast. Being obsessed with hills, I’m usually dismissive (and sometimes quite rude) about flat areas, but this made me reconsider. It’s not quite Texas, but it definitely has a ‘big sky’ feel to it on a nice day. They like to grow stuff round there, and you’ll be taken through some tiny little lanes that zig-zag their way through the fields, bringing words like ‘idyllic’ to mind. The final phase is through the Yorkshire Wolds which was a new area to me, but Sustrans guide you through the gently rolling hills on yet more almost deserted roads. The choice of roads for the whole route is so good that after I finished the trail and made my own way down the coast to Hull it just felt ‘wrong’ somehow. I’m totally sold on the idea of touring now and I’m already thinking up future routes (and excuses) so I can get the panniers on again. I probably wouldn’t tackle 135 miles in a day with the panniers again, but I reckon 60-80 miles would make pleasant days for me, depending on terrain of course. 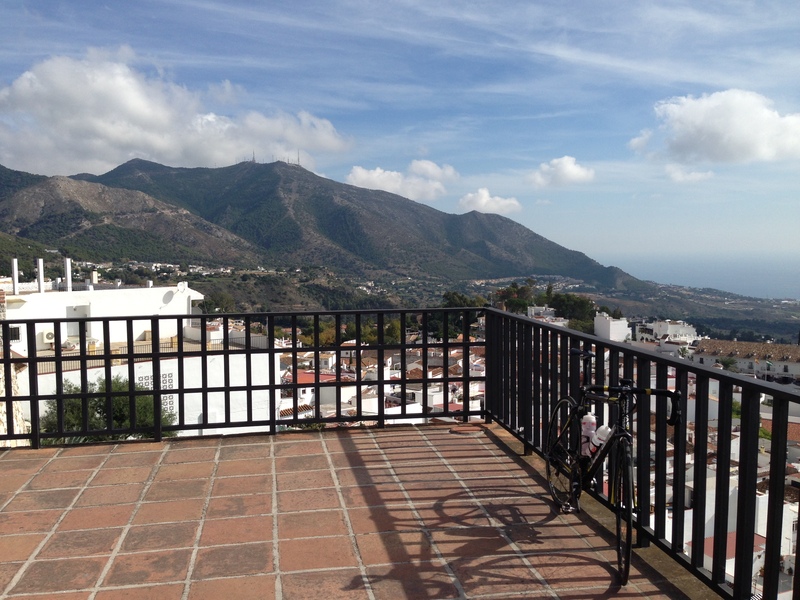 So if you’re looking for a good few days pedalling then give it a go, wherever you’re from. If you want to avoid carrying your own luggage, dispense with the logistics and generally get thoroughly looked after then get in touch with Peak Tours, otherwise, just get your panniers on and get pedalling! 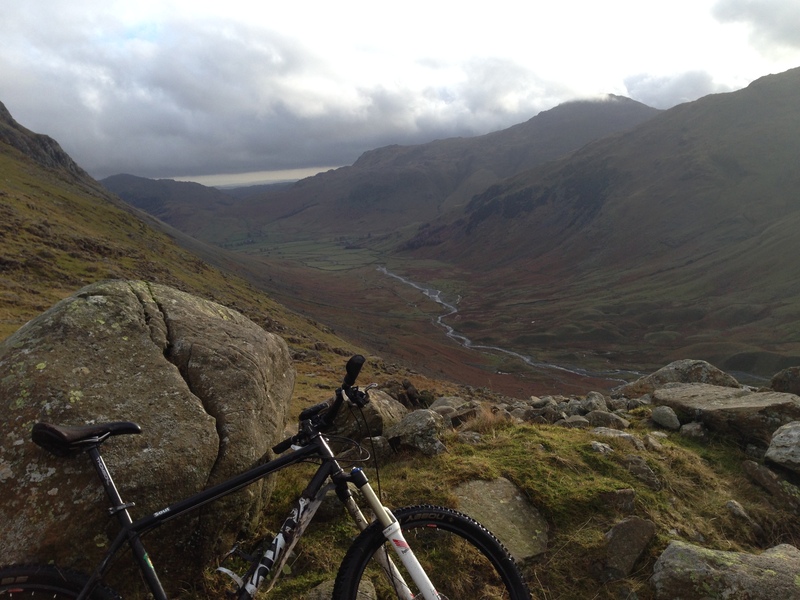 Keswick to Windermere, MTB style! As soon as I spotted the opportunity to be dropped off in Keswick with my bike on a Monday morning, my head went into overdrive to plot a route across some untried bridleways towards a train station that could return me back to civilisation. Despite it being the depths of winter, I had a craving for some old fashioned hike-a-bike adventure. Maps were spread across tables, the internet was scrutinised and train timetables were studied. By car, the route route between these popular Lakeland towns is a mere 20 miles by the A591, however my plan involved the Stake Pass bridleway, which promised to offer a pretty gruelling day out. I’m a big fan of using trains with the bike. There’s nothing wrong with doing a loop, but there’s something about a point-to-point ride that makes it a proper journey. 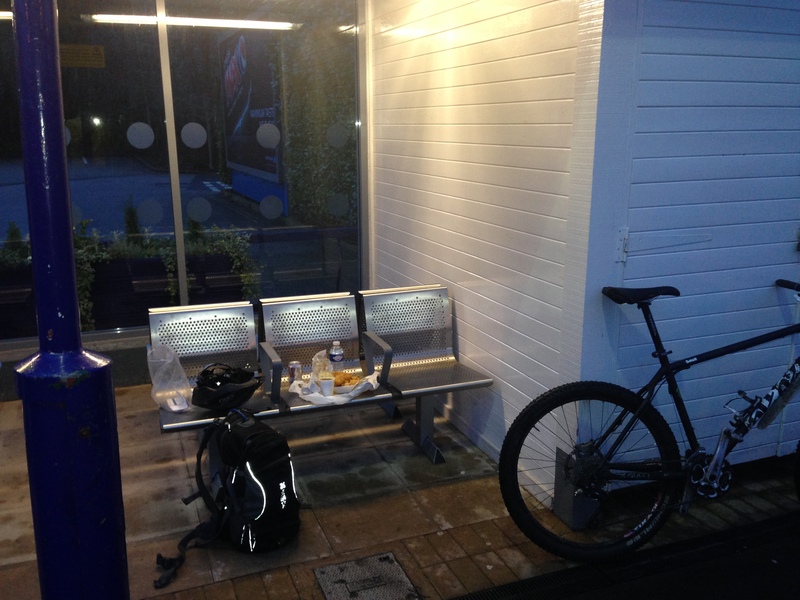 I’d booked a train from Windermere at 5pm, with the aim of arriving at dusk and having time to grab a chippy tea to eat at the station. To make the 3 hour return journey (and probable sleep from exhaustion) more comfortable, I’d packed lightweight clothes in a dry bag. There’s a time and place for worrying about carrying too much weight, but these kind of rides are not such occasions. On a winter mid-week day, miles from the nearest road or house I might not see another person should I run into difficulties so maps, compass, food, water, tools, extra layers and survival blanket all took the backpack up to 6KG. It’s all good for the legs though. I’d also cunningly put Stake Pass near the start of the ride, so that if it took more time/energy than planned I could tarmac it back to Windermere and skip the rest of the off-road sections I had lined up. It might all sound a bit dramatic, but I didn’t want to be another mocking incident on the local Mountain Rescue web site. For any readers not familiar with the Lake District, it’s one of England’s most famous and popular national parks. The lakes and hills (or fells as they’re known) make it a favourite playground for cyclists, mountain bikers, hikers, fell runners and rock climbers. Fortunately it’s not all overly congested, partly because most of the tourists prefer not to leave the cafe’s and outdoor clothing shops. 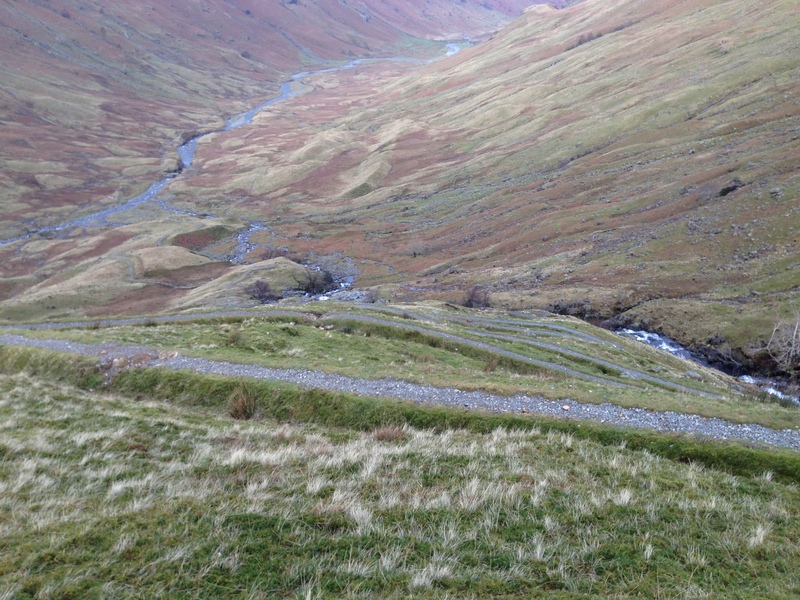 I’d read that the bridleway on the East side of Langstrath Beck could be boggy, but that there was a rocky farm track that gave way to a footpath on the West side that would be drier. I’m usually a stickler for Rights Of Way, but given that the UK had only just stepped down from flood alerts, another pair of wheels/boots would be the last thing a grassy bridleway needed. Ecological justification. The farm track was great, a few techy bits but very rideable. I could see the bridleway across the big wide valley and it looked grassy, so I imagine it would have been boggy. All goes well till you go through a gate and wonder where the track went. You’re now on the footpath and the next couple of miles will have you in a sequence of ride/push/carry, but if you’re taking this route on then you’re unlikely to get too upset about this. As you progress up the valley, look for a waterfall high up ahead on the left side of the valley – Stake Pass zig zags up the right hand side of this. It’s a strange moment when you realise this, as a) you expect to be continuing down the valley and b) it looks vertical. Once you cross the river on the narrow wooden bridge the real climbing begins. The path’s been tastefully manicured within the last few years and is mostly fine gravel and very sharp hairpin bends. With good legs and small gears you can ride quite a lot of it though. Once you get half way up and look down you’ll see that it’s like a mini Alpine road pass, but instead of wide tarmac roads, its a gravel track half a meter wide. Annoyingly, the hairpins are too tight to ride round, which breaks your flow on the way up and would really spoil it as a descent. Eventually you hit the top and you just follow the obvious and mostly rideable track until you catch sight of the Great Langdale valley, your next destination. If you thought the ascent was mad, wait till you see the descent. It plummets down quite abruptly, with rocky step-like zig zags. This was just how I remembered it from a hiking trip last year, though my claims of “Yeah, I reckon I could ride most of this” didn’t come to fruition now I had a bike with me. I know there’s riders out there that are brilliant at this kind of riding, but a healthy fear of injury meant that I pushed the first section but rode increasingly towards the bottom. As you cross the bridge, look back up and you can barely even make out the path against the imposing hills that now surround you. The track through the valley floor is brilliant – not massively technical, but certainly grand, and if you’ve not hurt yourself on Stake Pass you’ll be feeling pretty pleased with yourself, so soak it up. As a guide, it took me just over two hours from Rothsthwaite to the Old Dungeon Ghyll including a few photo stops and a quick sandwhich. From here to Windermere are a multitude of bridleway options so I’d planned as many that I hadn’t ridden before. I had to miss out the last one as the light was fading, but the last few miles of tarmac delivered me nicely to the fish and chip shop, just as planned. I’m not sure it’s the kind of ride I’d want to do every weekend, and I appreciate that it’s hard to convey the appeal of such a ride even to most regular cyclists, but there’s just something special about taking on a remote pass that you’ve never done before. Fortunately there’s loads more in the Lakes for me to start planning! A recent trip round the classic Jacob’s Ladder loop in the Peak district highlighted a problem that’s been developing for a while. Whilst I’m fine on the smoother, more flowing descents, when it comes to the technical rocky stuff with drop offs and loose boulders I seem to have lost my bottle. Any non-mountain bikers reading this may well be thinking “What the hell are you trying to ride that kind of trail for anyway?” but that’s mountain biking. At least in the Peak District anyway, other UK regions may have easier riding geology, but I don’t want to stir up the North/South divide. The ride had me thinking back to 10 years ago when I first started biking round there: bumping down the same trails on a heavy bike with 80mm of unresponsive front suspension and dangerously ineffective v-brakes. I don’t remember being as cautious as I am now on my fat tyred custom hard tail. So what’s going wrong? I reckon this is a big part of my current problem: too much time spent mincing around in lycra on the road bike. I’ve always mixed the disciplines up, but this year has had a distinct lack of ‘proper’ mountain biking. The majority of my off-road mileage has been on the cross bike on trails considerably tamer than Jacobs Ladder. It’s not been entirely wasted though, as my off-road climbing is faster than ever thanks to my high mileage. I’m crap at being injured. If I can’t ride then I start going a bit weird. This is in my mind as I bounce down rocky trails, maybe more than it should be. As you get older you become aware of responsibilities and I’m not the carefree young man that I was. There’s a pro road cyclist who overcame his fear of fast descending by listening to classical music, but I think I’ll need more than a change of playlist to sort this out. So what’s the plan? Well having slept on it, I’ve realised that like most things in life, if I want to get better I’ll have to practice. I’ve never deliberately practiced riding before, I’ve just ridden. So I might actually go out and find a difficult section of trail and repeat it a few times (I believe proper riders call it ‘sessioning’ a section) then move on to a harder section. Sounds quite dull but I reckon the returns should pay back massively. I might also take to wearing knee and elbow pads to help with confidence whilst practicing. I suspect going back to riding full suspension would also help me get my downhill mojo back, but I know I’ll not get clearance for it at home…. 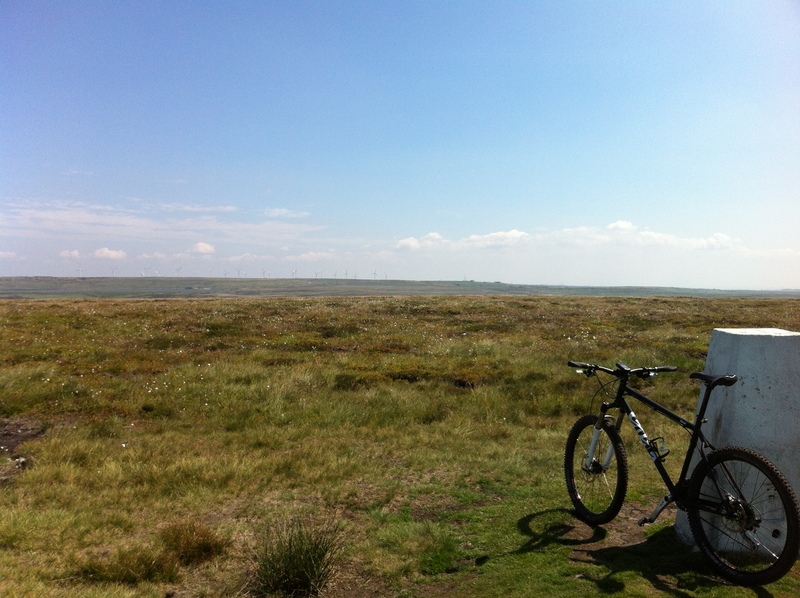 No work, a good weather forecast and a rest day on the Tour de France – the obvious thing to do was to grab the mountain bike and head out on an adventure! 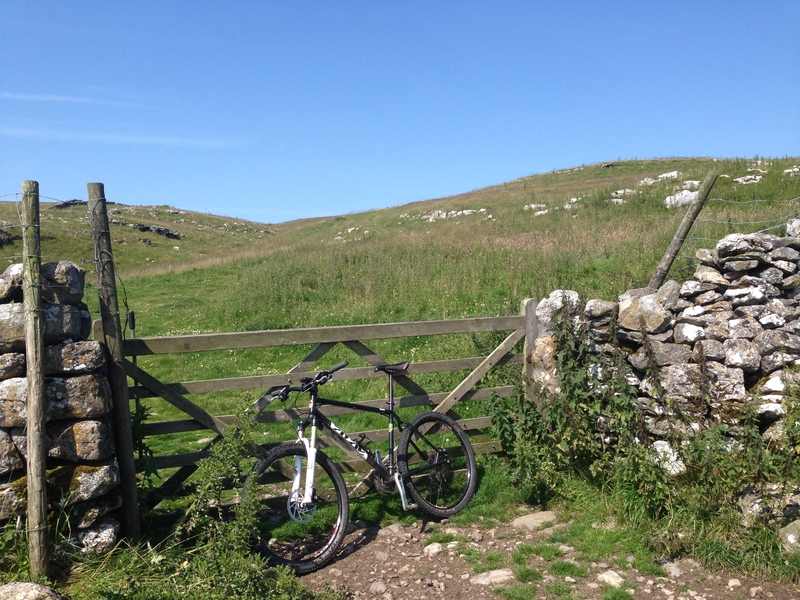 From the list of rides to do this summer, a test ride of the recently opened northern section of the Pennine Bridleway seemed to fit the bill nicely. 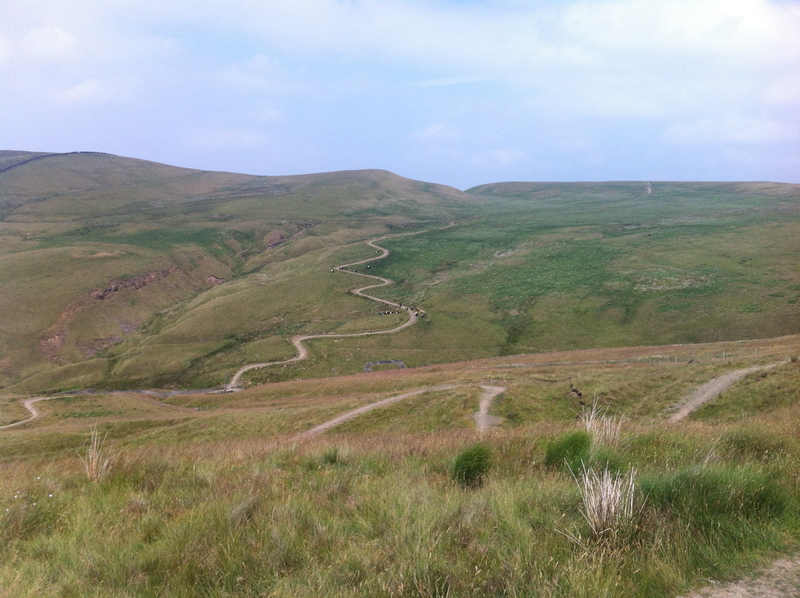 I’m a big fan of these long distance route type things and the Pennine Bridleway’s a incredible route. Though originally inspired and initiated by the horsey brigade, UK rights of way laws also make this a prime mountain bike route. I know the southern section that runs through the Peak District to the South Pennines where it meets the 47 mile Mary Towneley Loop, which I know particularly well. And until fairly recently, that was it. Last year though, the next instalment opened, from the top of the MTL right up through the South Pennines and the Yorkshire Dales into Cumbria. If they get people out on their bikes and help bring a bit of money into rural areas then it’s a win/win situation. I like the idea of a mountain bike route that goes from A to B, but it also makes for a complicated day ride. You could get crafty with a riding partner and leave one of your cars down trail and then use it to get back to the other car at the start…. or you could use the train! One advantage of living in Manchester is that it has train routes heading out in all directions. I’m moving out of town a little way next week, so it made sense to utilise these stations to tackle this point to point route. The railway strategy today was to get a train to Mytholmroyd in the South Pennines and then ride 12 miles of trails to get to the start of the new PBW section, then slog north on the trail 22 miles to near Gisburn, at which point I’d veer off and ride 8 miles of country lanes to the station at Clitheroe. I was tempted to carry on to Long Preston on the edge of the Dales, but the train journey times and price doubled so I’ll have to continue this particular adventure another day. Here’s the ride data on Strava if you want to pinch the route. The South Pennines are often overlooked as an area of countryside, which is a real shame. Admittedly, it’s not a designated National Park and there are a few creepy farms to occasionally pass through, but to this rider at least, its dramatic rolling moorlands make it well worth a visit. Even the guide book I’d read was dismissive of the area, stating that it was the Yorkshire Dales section that would appeal to people, which is doing the area a massive disservice. One thing to be wary of on such a PBW mission, is that the route manages to sidestep every village and shop where you might have planned to stock up on water. I did an hour without water in rare British summer heat and eventually had to get the map out to plan a diversion to a local pub to rehydrate. The symbol on the OS map is a pint of beer, but I was was just happy for them to fill my camelbak with water. So anyway, what’s the route like then? Really, really good! As ever, it’s a mix of existing bridleways, reassigned (and re-gated…) paths, along with some totally new bridleways. I’m pleased to report that the new bridleways have been tastefully and sensibly constructed – a rock/gravel base planted with grass seed that should drain well and is already settling in to a trail that looks as old as the some of the other bridleways.